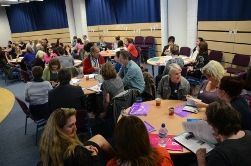 This was a fantastic event on October 1st 2015 at the Learning Centre in Stafford, with representatives from around the region: clinicians, commissioners, artists, musicians, arts organisations, third sector organisations and service users and carers. Speakers included Dr Jane Povey, (Creative Inspiration Shropshire), Jayne Howard, Arts for Health Cornwall and Creative Minds of South West Yorks NHS. Some great networking opportunities and inspiring and moving stories. There was lots of networking to find solutions to existing barriers and difficulties plus valuable connections made. It was a very inspiring day and with over 80 delegates and really created a creative buzz around the centre. Thanks to speakers and all who attended and made it such a successful event. Informative, inspirational and moving / Good connections and useful information and confidence in my own practice / Best things about the day were the speakers, the networking and diversity of ideas and knowledge / Very inspiring speakers, passion, commitment from workers, touching and inspirational stories from the heart.